The Celtics and Magic begin their fight for the right to a Championship run today in Game 1 of the Eastern Conference Finals. Undefeated in the postseason, Orlando has played superb basketball throughout the playoffs resulting in first and second round sweeps against Charlotte and Atlanta thanks to their great defense and 3-point shooting. While the short series gave the Magic a chance to get some quality rest, I wonder if they will be as sharp when they return or if the long layoff following Monday’s Game 4 win over the Hawks will hurt them. This year’s revamped Orlando team boasts four All-Stars: Dwight Howard, Jameer Nelson, Rashard Lewis and Vince Carter. 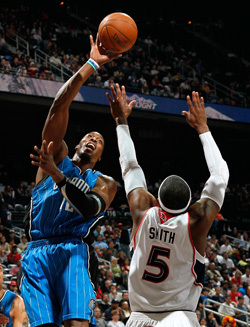 Top defender and rebounder Dwight Howard has lead the way for the Magic. Howard will have a hard time establishing his low post position against Celtics’ center Kendrick Perkins. However, Howard is too long and too athletic for Perkins to challenge him. If Perkins can’t put his body on him and can’t root him out of that low post area, Howard will present a matchup problem that could force Boston to double-team. If Boston has to double-team Howard that’s a problem because of the 3-point line as Orlando leads the league in 3-pointers taken and 3-pointers made. Their offensive game is structured around their center in the low post or the 3-point line. They become very difficult to guard when their threes start to drop. And when they don’t, Orlando doesn’t get discouraged – they just keep shooting them until they eventually start making them. Orlando’s bench has gotten plenty of action during the season and has seen a lot of minutes on the floor. Backup center Marcin Gortat from Poland has proven very valuable in the playoffs because Howard has gotten into so much foul trouble. Gortat has come in and given the Magic very solid minutes as both a defensive presence and rebounder. As for Boston, they were a commanding force against the Cleveland Cavaliers, who despite dominating the regular season for the past few years have not been able to carry that success into the playoffs. The healthy and rejuvenated Celtics pulled off a huge upset over the Cavs in the Eastern Conference Semifinals. They played hard; they played smart, and they had different people step up and perform. After missing last year’s playoffs and struggling with a knee injury all season, the resurging Garnett was outstanding against the Cavs. Rondo was aggressive, in control and did a tremendous job of creating offense for his teammates as well as making shots. 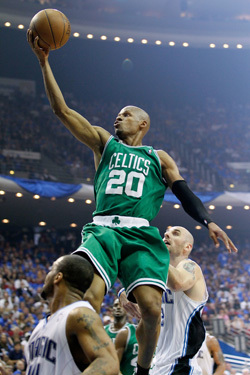 And Ray Allen contributed significant numbers from the field, knocking down big buckets when his team needed them most. But in all honesty, Boston did not play their very best basketball. Paul Pierce had a mediocre semifinals round, perhaps due to the draining task of guarding LeBron. And Rasheed Wallace was also very sporadic. If Boston manages to get all of those pieces operating at full throttle at the same time, they will play the Orlando Magic nose-to-nose. In fact if first unit players Pierce, Garnett, Allen and Rondo get it going along with Wallace as a major contributor and Tony Allen (who gave the Celts huge minutes against Cleveland – chipping in with timely points and establishing a defensive presence), I give the edge to the Celtics. The veteran Celtics are battle-tested and know what it’s like to win in the playoffs. They are a very physical, forceful team and have played terrific on the road. All in all I expect this to be an outstanding seven-game series.